Handel’s monumental settings of this psalm for soloists, five parts choir and orchestra was first performed in Rome in 1707. In the 1980s it was argued that the psalm might have been part of the so-called ‘Carmelite vespers’, although the most recent hypothesis claims it was performed on the name day of King Philip V of Spain. 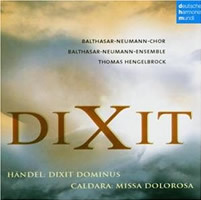 There are already many good versions of Handel’s Dixit Dominus, but from the beginning to the end, this recording is characterized by beautiful orchestral texture and vivid tempi – Hengelbrock is even a few seconds ‘faster’ than Minkowski. The frequent discussion about fast or slow tempi is often missing the point. This ‘fast’ recording is a good occasion to remember that the tempo itself is nothing alone. The vivid tempi are here combined with accurate articulation, musicality, admirable senses of colours and drama, and great care concerning the text and its meanings. The result is totally coherent: a very expressive and achieved interpretation. For example, listen to the powerful but not grandiloquent opening, the abrasive aspect of ‘Juravit Dominus’, the wonderful contrasts and linkings of the ‘Dominus a dextris tuis’ or the famous soprano duet with choir ‘De torrente’. No doubt one can imagine greater solo voices, but would that really be desirable when this performance has such a marvellous atmosphere? One of the particularly interesting aspects of this recording is the performance of the orchestra. Hengelbrock uses a strong continuo – the two theorbos, very active and efficient, could bother some listener’s ears or brains – and the sound recording offers a good balance between the choir and the orchestra. The orchestra not being crushed by the choir is a really good point, especially because they are both excellent and thus the orchestra is really involved through its important illustration of the text. The less achieved aspect of this recording is certainly the performance of the soloists, who are members of the choir. Though excellent, Handel’s writing and their conductor are so demanding that sometimes they seem to be very close to their technical limit. Furthermore, the sound recording tends to present them as being at the back of the choir, but it is worth noting that listening to this on an SACD player enables a slightly better balance between the soloists, choir and orchestra. The programme is completed with two beautiful works by Antonio Caldara, although the interpreters seem to be less at ease in these. Hengelbrock offers us a declamatory Dixit Dominus – almost a proclamation! – which perfectly illustrates both the text and Handel’s treatment of Italian expressiveness and virtuosity. Some could consider that John Eliot Gardiner’s Monteverdi Choir offers a slightly higher standard of execution (Philips, 2001), but Gardiner’s approach, though powerful, is more detached and mannered, and the more reverberated acoustics are prejudicial to the accuracy and the clarity of the listening. Hengelbrock’s Dixit contains the most evident greatness, reserve, power, and emotion.